Eleven major companies in Japan are collaborating on developing a hydrogen fuel station infrastructure to support Government FCV policies. A group of 11 major Japanese companies involved in transport, fuel and utilities have announced the joint establishment of “Japan H2 Mobility” (JHyM) aimed at the full-fledged development of hydrogen stations for fuel cell vehicles (FCV) in Japan. The newly formed JHyM will foster the deployment of hydrogen stations throughout Japan under the guidance of the Japanese Central Government’s Ministerial Council on Renewable Energy, Hydrogen and Related Issues. In alignment with Central Government policies, the 11 founding companies joined forces to create the world’s first framework in which not only infrastructure developers and car makers, but also investors are involved in collaboration, based on the common belief in the effectiveness of hydrogen and FCV for mobility and continued sustainable societal development. To tackle the key issues raised during the initial stage of FCV promotion, JHyM will ensure that infrastructure developers, car makers and investors each do their part to support the successful strategic deployment of hydrogen stations in Japan, promoting effective operation and facilitating a positive cycle of improved convenience for FCV users. The ultimate goal of JHyM is to smoothly increase the number of FCV on the road in Japan, and thus to sustainability build the hydrogen station business. JHyM aims to complete its mission within 10 years. It intends to start building 80 stations nationwide by fiscal year 2021 in line with the Japanese Central Government’s “Strategic Road Map for Hydrogen and Fuel Cells”. This roadmap released by the Council for a Strategy for Hydrogen and Fuel Cells targets the completion of about 160 hydrogen stations serving around 40,000 FCV by fiscal year 2020. The new company will, while taking into account subsidies from the national government and initiatives of local governments, develop its own original “Hydrogen Station Deployment Plan,” in order to create an environment in which many users can enjoy driving fuel cell vehicles in Japan. Wider participation than its initial member companies is to be sought to ensure to complete the target deployment plan. 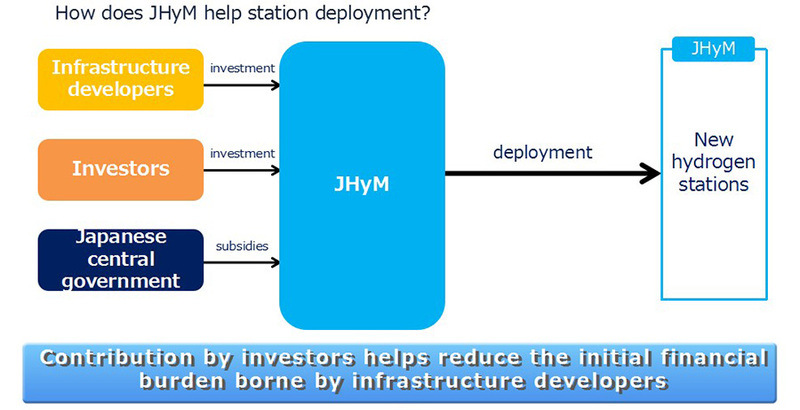 In order to encourage customers to use hydrogen, JHyM will improve the convenience of stations, coordinating with the Association of Hydrogen Supply and Utilisation Technology (HySUT), an industrial association of hydrogen station developers, for example by extending the number of service days per week to meet increased demand. Additionally, JHyM will collaborate with external organisations, such as the Fuel Cell Commercialisation Conference of Japan (FCCJ) and HySUT, to reduce cost by addressing issues such as the standardisation of equipment and revision of regulations. JHyM will start operating in April 2018, aiming to attract the wider participation of hydrogen station operators and investors, and to achieve sustainable hydrogen station business and FCV development in Japan.